SEVEN STORES TO SERVE YOU! 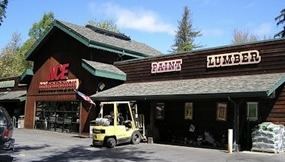 Each of our Scotts Valley, San Lorenzo Valley and Carmel Valley locations is unique and we carry different items and brands. Check our locations for details, directions and hours. The Scarborough's business was originally started in 1957 by Gene Scarborough, a WWII POW veteran who left his home state of Mississippi with his family in search of a new start in California. He eventually settled down with his wife Nena and his three children, Alvin, Linda and Mike, in Scotts Valley where he bought and ran Standard Lumber. Over the following years, Standard Lumber became a staple business in the Santa Cruz Mountains, producing quality redwood products used all over the west coast. In the early 1970's, the lumber business began to change as did Standard Lumber. With Gene and Nena's children now active in the business, they chose to change the name to Scarborough Lumber and expand and open retail hardware and lumber stores in Scotts Valley and Ben Lomond, California. Over the years the family has expanded to open additional stores in Boulder Creek and Carmel, California. The businesses are now being run by the third generation of the Scarborough family and our dedication to the community and our committment to providing quality products and friendly customer service, is just as strong as ever. As a member of the Ace Hardware cooperative, customers get the advantage of shopping a nationally known brand with the pride of local ownership. Scarborough Lumber has thrived since 1957 by adapting to the unique market demands of each of our locations. The Scarborough family is grateful for the opportunity to operate in Santa Cruz County and Carmel Valley and through community involvement and exceptional customer service, we hope that our business will continue to thrive for future generations.